I’ve finally started hand quilting my queen-sized quilt. Hopefully I’m going to get better as I go along. I’m pretty sure any practiced quilter would frown on the size of my stitches – they should be much smaller, but I just can’t seem to manage a tinier stitch. When I first started out I didn’t have a great thimble, which made things much harder. 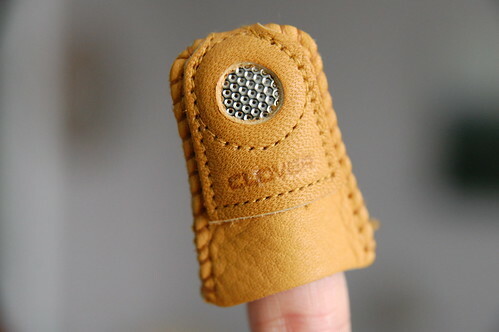 I finally got one of these Clover thimbles. It’s leather, so it feels comfortable. It also has a metal coin on the pad of the finger that allows you to push the needle through pretty easily. I really like it. I’m just hand quilting straight vertical lines that are about 1.5 inches apart. I use a piece of low tack painter’s tape as a guide for my stitching line. This was a tip I got from Johanna. It works like a charm. The quilt is set up on a 17″ square Q-Snap frame and I try to do an entire 17″ square in each sitting. The frame fits in my lap and the rest of the quilt takes over the couch. It takes a couple hours, but I think I’m getting a bit faster. At this rate, I have about 32 more sittings. So perhaps in a few months (and dozens of dvds) I’ll be done! In the meantime, I’m starting to think about picking a colour palette for my Double Wedding Ring quilt class in March. Greys with pastel brights? Browns with purple tones? Aqua with pinky reds and cream? It’s a beauty! Your thimble is like nothing I’ve ever seen (outside of a science fiction film). Karyn it is coming along so well! Beautiful. I am so sad not to be able to take the Double Wedding Ring Quilt class coming up, but I will be in Vancouver for one of the dates and didn’t want to miss a thing that Joahnna was teaching – I always learn so much. I am looking forward to seeing what you choose – I think my vote would be for Aqua with pinky reds and cream! Hi! First, I love your blog, and I wish I lived closer (ie in the same province) so that I could come and take part in the great things you’ve got going there! Thank you for sharing with those of us internetters! I might even make a dress as a direct result of your efforts in the summer! I too have been trying out hand quilting, and I also have one of those thimbles! They are good, although sometimes I wish the metal part curved over the tip of the finger…but then I wonder if maybe that’s a sign that I’m doing it wrong!? It is slow going, and my stitches are suspiciously big too, but it really does look beautiful I think, in spite of the technical work in progress feeling I have when I’m doing it sometimes. My husband says it kind of resembles my handwriting, and I think that’s a nice way to think about it. There are a few videos of youtube that show people hand quilting who have some experience, and there is a definite straight up and straight down motion to the needle when you’re stitching. It seems like any type of lateral motion at all is the death of small stitches! Also, I’ve been loosening the quilt on the frame a bit, and that helps because you have a bit of room to get that up-and-down motion without straining anything. I don’t think there are many things that beat a stack of DVDs and sitting under a bit of quilting though! Good luck, and thank you again Karyn! hand quilting looks so fun!! Do you sell those 7″ square Q-Snap frames? I did a quilt with a similar stitch pattern, and I chose to do it by hand as well. I didn’t have a thimble though! I improvised with a band-aid and some batting to protect my finger, but it didn’t work well! 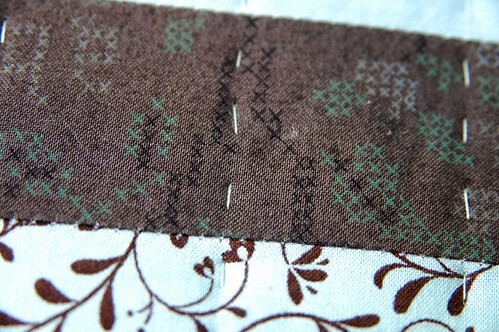 I love the way your quilt is coming together, and I the tape is a great idea. I could have used one of those frames as well, so I guess I’ll try to be more prepared next time. Hi! Wish I could visit your shop, but I am far away. Lovely job on your quilt. It’s really beautiful. For your wedding ring quilt, I really like the idea of aqua with pinky reds and cream. It may just be the opposite of what you’re doing right now! Both so pretty, though. Wonderful looking quilt! I love your colour choice and design. I am just about to start learning to quilt and it seems like there is alot of learning ahead of me, so much so that I’m not really sure how or where to start! I’m really enjoying your blog – thanks for sharing it with us! totally inspiring karyn. my career is really get in the way of my craftier life. thanks for living it for those of us who can’t. ben – true & i’ve seen weirder looking thimbles out there. lauren – you’ll get to see all the results of the class and get even more ideas for when you can take it. and yes, i’m currently leaning towards the aqua, red and cream colour scheme… especially since some lovely new fabrics just arrived in just those colours. jen – thanks so much! it’s great to know you’re finding inspiration here with my escapades. i’m really hoping to get better with the hand quilting over time. i’m not worrying too much about it, cuz i just love the wonky little stitches, either way. i’ve never used a thimble before, so it still feels funny. i’ve got a book someone lent me to read and i should check out youtube too. i’ll report back soon! 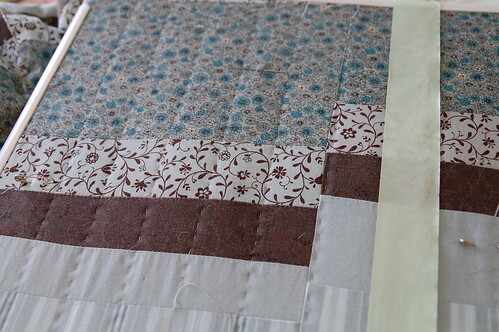 celine – hand quilting is pretty relaxing, if you don’t have a deadline! i just hope to finish it sometime this year. robyn – i love your homemade solution.. you could also try taping a penny to your finger. lol! some people quilt without a frame and prefer that. i’m going to try it out and see what i think. there are always so many ways to do something! leah – hey, we miss you! when i first came up with the business idea it was because of a sewing cafe in Berlin called – Linkle – have you come across it? shin ae – i wish you were closer too! thanks for the vote on the aqua/red/cream colour scheme.. i think it’s going to win. gretel – there are a lot of really good books and i recommend starting with something small and simple. it’s a lot of fun, so i think you’ll love it! liza – thanks! at least your career (aveda) smells amazing! i’m so in love with the candle and hand lotion you left at the shop. just found your blog – can’t remember the trail by which I got here – and I’m about to start handquilting. I am Mennonite, so I have done this before with lots of ladies sitting around a big quilt frame. But I’m going to try the sofa/DVD route. And I think I’m going to try it without a frame first. Any insights from your experience? This will be my second quilt. The first one I did was a 9-patch that I machine quilted (and my daughter is napping under this very minute!). Thanks! Hah. I’m about to start hand quilting too – my son’s quilt is going to be my first foray into that world. I figure why not learn on someone who is a little less discerning and will just love it because it’s his and Mum made it. I too have just begun to hand quilt. I have made a king size Irish Chain quilt for my future son in law. I machined quilted the “chain” blocks but I have now begun to hand quilt Celtic knots in the large plain blocks. It is slow, which is fine with me, my dislike is for how puffy the knots look. I can’t decide if it is the batting I use, warm and natural, or if I am making my stitches too small = too many? I am an avid cross stitcher so I don’t think it is my tension….or is that a false hope? I have never seen a Celtic knot hand stitched, are they supposed to be puffy? Thanks for what ever clues you can give me! ali – hmm. i wish i had some answers for you. i don’t know much about celtic knots, but this quilt sounds amazing. do you have any photos of it?